I had no idea that I struggled so much with my identity until I met my New Testament professor. She is a prophet in all sense of the word, and she pulled stuff out of my that I had forgotten for years. Most importantly though, I realized that I have a job to do in this world and in myself. 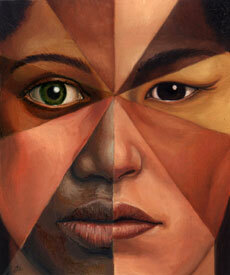 As an interracial woman, I have often found situations with different races difficult. At a young age I think I realized that the best way to ease tension (in most situations) is to laugh or make the people around me laugh. Therefore, if you know me, you are well aware that I poke fun at racial situations (often). This is something that I like about myself, actually. I enjoy my ability to make light of what could be hostile situations; I like that I am comfortable enough to point out the obvious to others. I realize that this may sometimes offend people, but that’s the risk I take. Anyway, back to the important part. Instead of understanding ALL of my heritage, I thought I had to identify with ONLY ONE side of my race. I grew up in a community that was (and is) a majority white. Most of the people I knew and associated with were white. Until I went away to college, I didn’t really identify with anyone who LOOKED like me. As an adult, I am excited to say that the nationality of my friends spans the globe! I enjoy the diversity of my peers, and find it so exciting to learn more about every culture God created. However, I think it’s important to note that I spent a lot of my life not knowing about my own culture! At 26 I realize that I don’t have to choose to identify with only a portion of who God made me. I have the esteem honor of embracing my own unique culture; that of an African American Italian woman! I am not white and I am not black: I AM DANIELLE! And I know that people will want to place me in a box and give me a label, but I am finally okay with the label God gave me. My students (99.9% of which are black) often tell me, ” You don’t count, Ms. Tabor! You’re not black! You’re not one of us!” And that would have bothered me a few years ago. But today I told my student (who made this proclamation) “Actually, I know my ethnic identity, and I do count!” I wasn’t upset with him, nor did I punish him for his comment. I simply let him know that I matter, even if he doesn’t see it. Even if NO ONE sees it, I MATTER! And as I type this, I can’t wipe the smile off of my face. I matter, and I count, and as I have said before, I am the ONLY me God needed, so that’s pretty darn special, if you ask me! My prayer is that through my years of pain, God grows my ministry, which I am learning with surround multiracial individuals. I am praying in young adults and children who I can mentor, and I am praying in people who can come along side my vision and help me grow it in God’s timing. It’s about using my pain to propel my passion…. it’s about finding my ministry in my mess. It’s about the people who I can affect who will have a chance at identifying with themselves earlier than I did, and for that, my pain is well worth it!